Winston and Bennett are both from litters sired by Dusty. Winston is eight years old; he is always a little gentleman. We always joke that if they were humans, Winston would have a monocle and a top hat, and Bennett would be a frat boy, lol! Duck has been adjusting well. Everyone who works in my apt building say he has the best personality of all the dogs that live here. 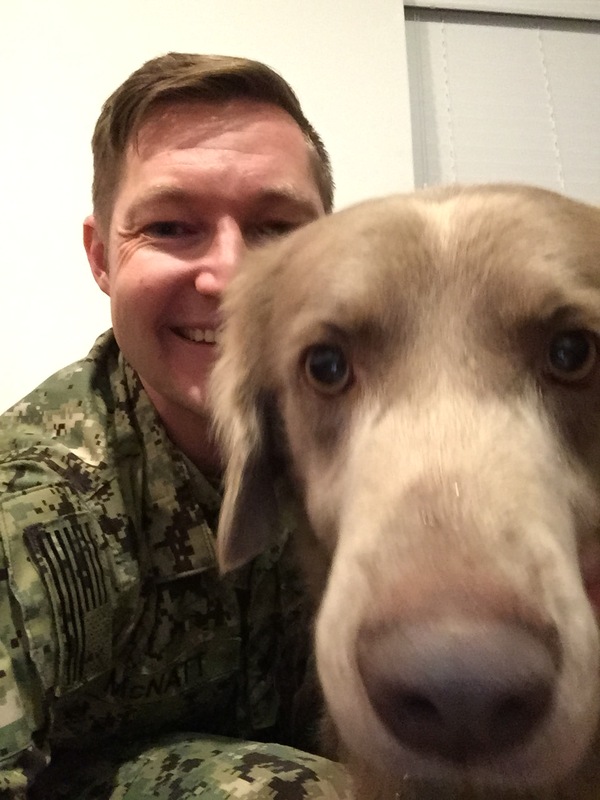 He is very mellow when he meets new people, and pretty good when it comes to meeting other dogs — but sometimes that gets him a little hyper. I have a dog park on the water about a mile away and he didn’t hesitate to take a swim, that’s not something that he liked doing before. I got him playing fetch a little bit too, just down the hallway of my building, but again not something he ever really showed interest in at all before. He really doesn’t like being in the crate during the day, so I’ve started just letting him roam in the apartment. Other than making a pile of my stuff on his bed, he seems to do fine with that. I’m going to be at sea for the month of April, but I have several people who want to watch Duck, so I think things will be fine. Breeder’s Note: You might remember the blog that featured Duck and Abe not so long ago-–Click here to read that blog. First, we don’t recommend anyone use rawhide bones, or chews. Bits can break off, and once ingested a number of things could go badly. The bits could embed in the lining of the intestine, and cause inflammation. Pieces could cause an intestinal blockage–this can be life-threatening. We know some folks do use them, but we do not have peace about them. Secondly, we hate to see you must deploy again. As we mentioned, it will be so important to prepare Duck for your departure. He needs a second home; someone who understands his needs. Keeping Duck and you both safe during this time of departure will be important. Nonetheless, we are happy that you are back together, and that Duck is doing so well. Thank you for taking time to get these wonderful photos for us to share. Everyone loves Duck. For those that don’t know, Storm and Dusty are Duck’s parent. Here are some recent photos of them below–these were taken by Larry Cleveland (Portland Wildlife Photographer). When Abe could not net a great job (despite garnering a Master’s in English from the prestigious University of Oregon) he made the decision to join the Navy. Duck came to stay with us (in Abe’s stateside-absence) for a lengthy period of time, while Abe found himself floating in the Indian Ocean, and working as a correspondent. I cannot remember his exact title; it doesn’t matter. Duck was here, and Abe was where the Navy wanted him to be—serving our country, and the world at-large. We rejoice in the reunion, and thank Abe for his service. What’s Up With The Snow? 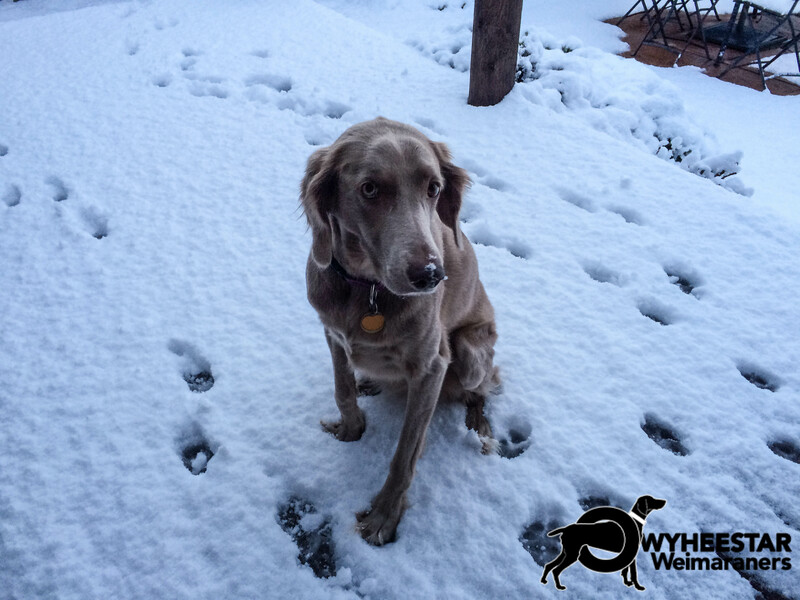 We woke up this morning (11/29/2014) with our first snowfall of the year. Siena isn’t sure that she likes it! Thanks for allowing her to be a part of our family. She’s the best!! 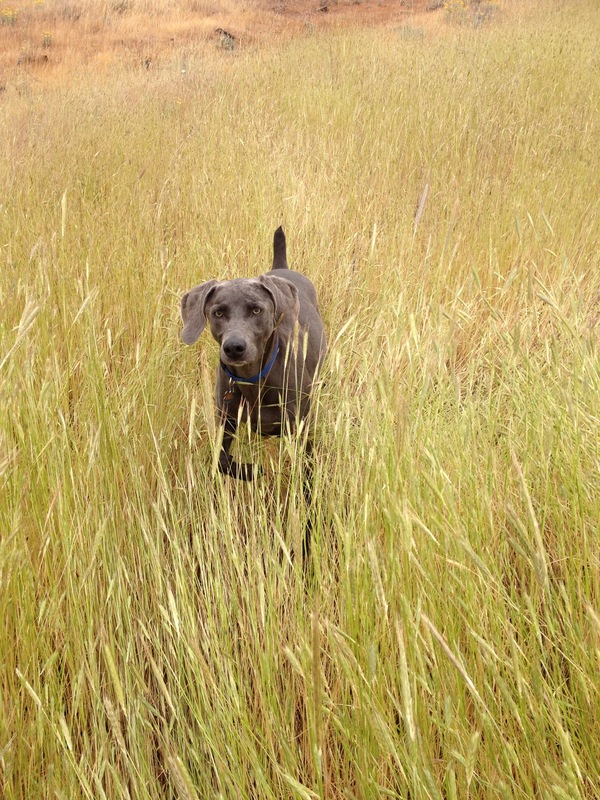 Breeder’s Comment: Phil and Connie live on Whidbey Island with their beloved Siena. Please take time to learn more about Phil’s recent book by visiting his blog — Click Here! 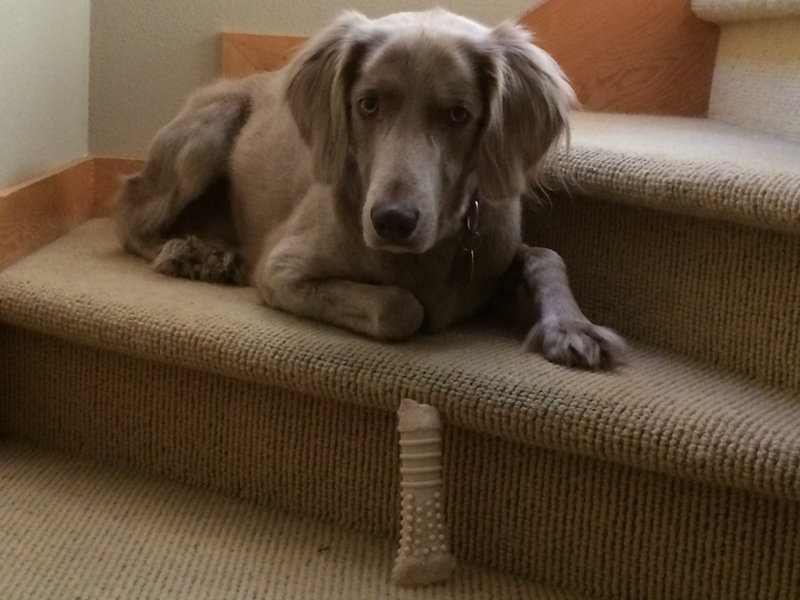 I thought you would enjoy this picture of Siena and one of her bones “guarding” the stairs up to my office. I just wanted to share our (Gob and myself’s) weekend adventures with you. This marked the first agility trial for Gob. We have been training for a while now and I finally had the courage to enter him in one. 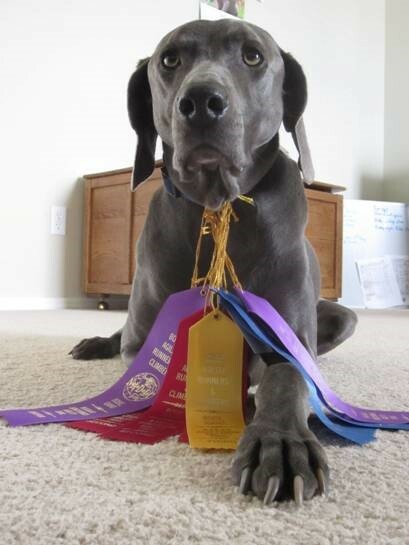 This was a NADAC (North American Dog Agility Council) trial and a much smaller trial than AKC. We were entered in seven courses and Qualified in two! Gob had a blast running each course…we got side tracked on one or two occasions. 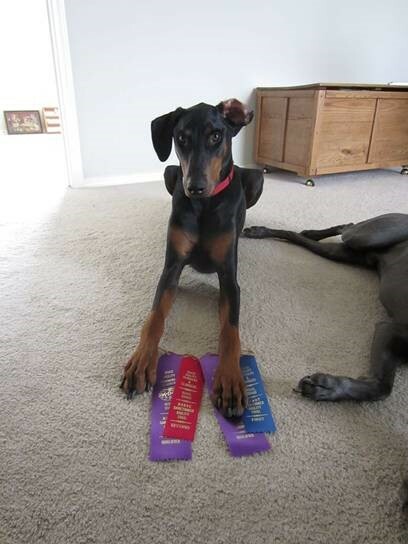 Kurt (the Doberman brother) came out to cheer him on and even tried to keep the qualified ribbons for himself. 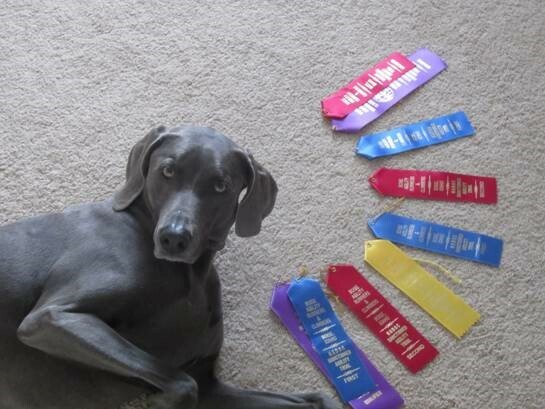 Exhausted–but we have the Ribbons! 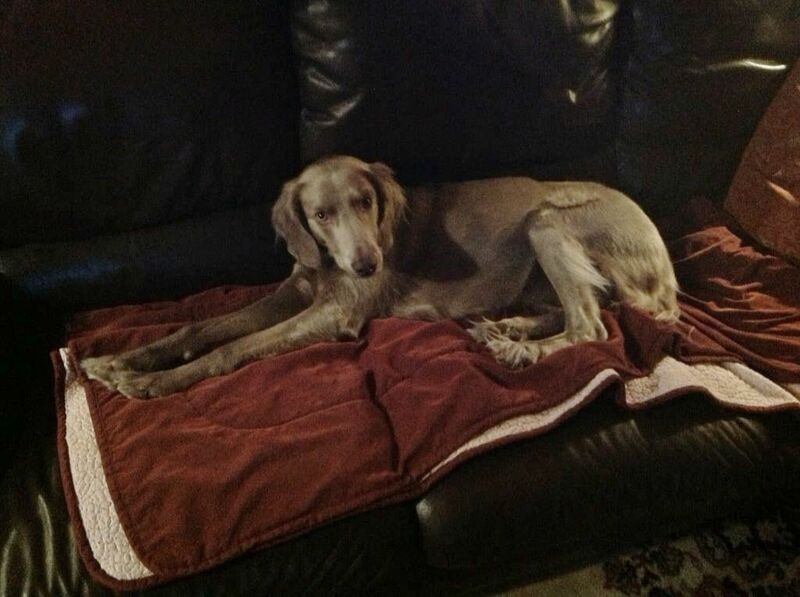 After three days of being at the trial, Gob is a tired boy and was open to just curling up on the couch and snoozing. Breeder’s Note: We want to send a note of Congratulation to the both of you. This is so awesome achievement. Gob is nearly 8 years old, and to achieve what he has at his age is impressive. You have done great with him Kari. For those reading this, you might not remember that Gob started agility training late in life. Click here to see a previous post featuring Gob agility training. Click here to see them training in February of 2013. We are glad Kari took the risk and enrolled in the competition, and we thank her for sending along the photos (with the update). We look forward to hearing more about Gob’s future successes. 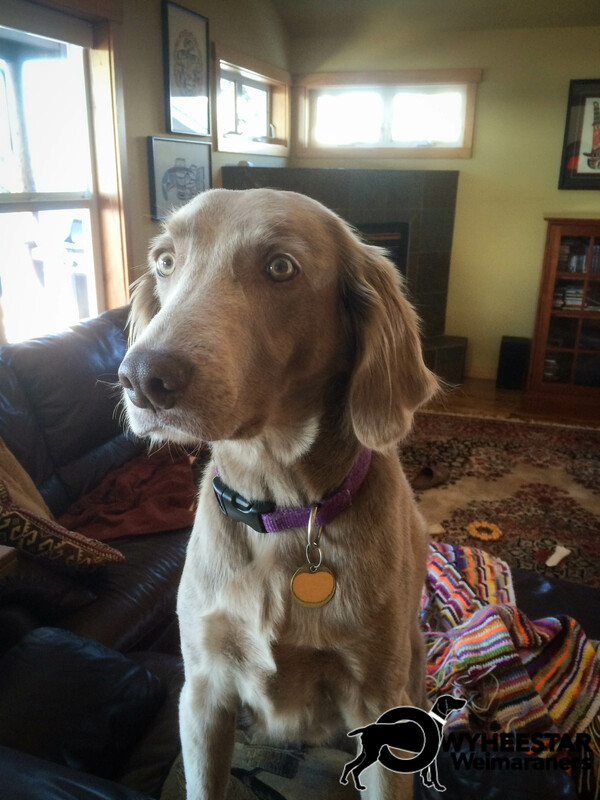 When Siena was discovered to be a longhair, it was too late. We had docked her tail. 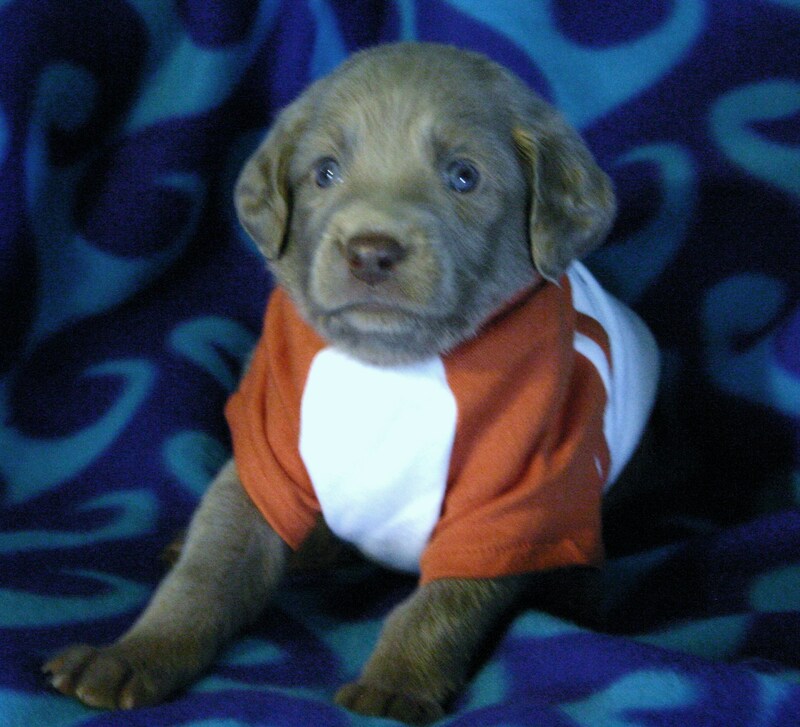 Storm and Dusty had produced two previous litters–neither contained any longhair pups. There was no known history of longhairs in their lineages. It was then we learned that they were longhair carriers, who had gone undetected for generations. This DNA marker can be passed along by the smooth=coats unknowingly. Anyhow, that was many years ago. Since then we have gotten hooked on the longhair; we love them as much as the smooth coats. We are going to be talking about them a lot in the next few weeks. We were afraid that Phil and Connie would not want a longhair, but they didn’t even hesitate. It seems they believe things happen for a reason. Over the years, we have stayed in touch. 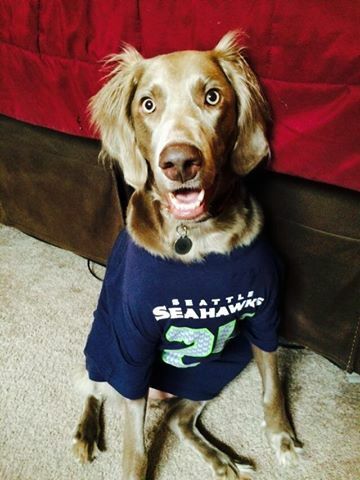 Last week when Siena was watching her favorite football team, Phil snapped this photo. Note: Although Siena’s tail was docked, we do not dock the longhair’s tail. You will have to trust us when we tell you that it is not as you imagine. Gob at 7….still a pup in so many ways! Well I thought I would give you a little write up. Gob will be 7 this summer and it still feels like he is a pup! His mannerisms haven’t seemed to change, he still has his moments that I like to think of as “blonde moments”! Last year we started taking agility classes in Eagle, ID, just to play around and get him out of the house. 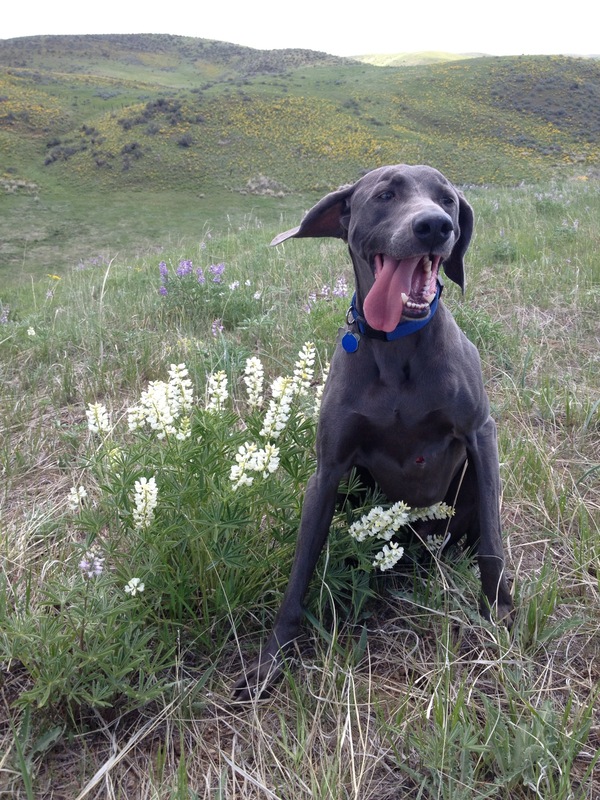 (Click here to see two videos and to read more about Gob’s agility success.) Gob took to it so fast! We are learning a whole lot and our dynamic has never been stronger. I love that he is more prone to ask me for direction rather than just do what he wants ( there are still those times though too). We will probably be competing in July over in Caldwell just to see what happens. Our trainer is amazed at how “old” Gob is and how quick he is learning and moves. I have had to take notes from a top level border collie trainer to figure out how to stay ahead! Note: Kari and Gob agility train (with Mary Hunter) at Dogs A’ Flying in Eagle. For more information, call Mary @ 208-938-2300. Just recently Gob got cut on some barbwire when we were hiking. He didn’t yelp or slow down one bit! He had to be stapled up (I love Snake River Vet), he kept a great attitude the whole time he was to be quite. Gob and Kurt –March 2013. Kurt has gained ten pounds, and stands three inches taller than God in the last two months. 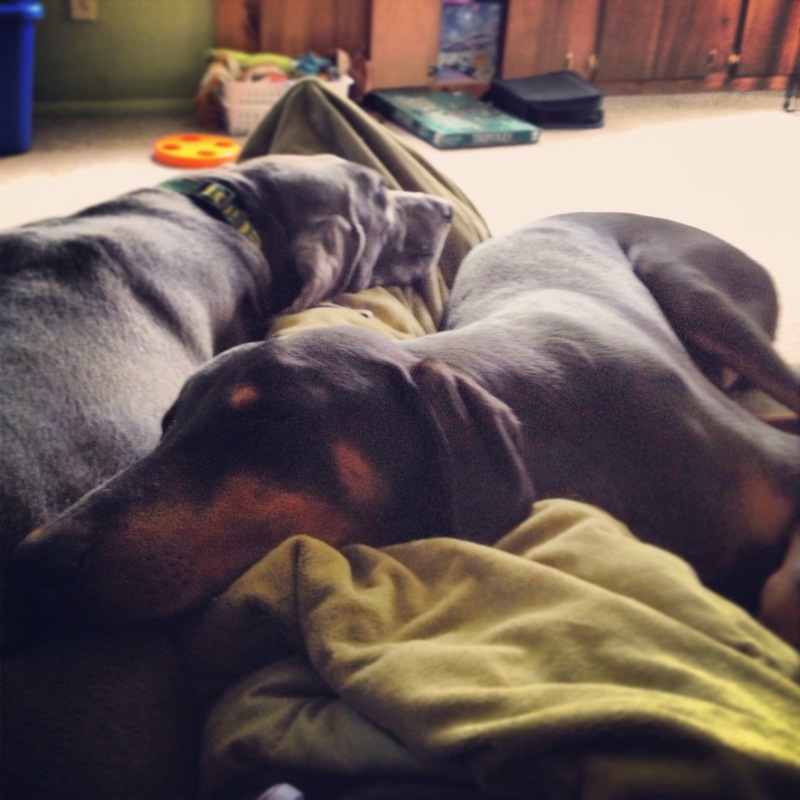 This winter Gob got a “little doberman brother”, Kurt. However Kurt is now much bigger than Gob, but is really great at taking chain of command. Gob is super patient and has really shown Kurt the ropes. Again, I can’t say how much I appreciate this dog! He is a great pace setter for my running, guard dog, nanny and all around good guy. 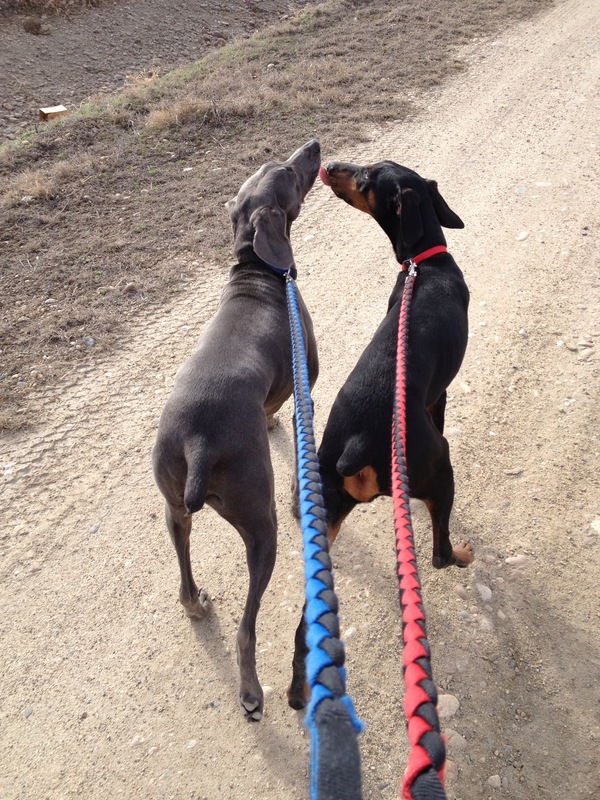 Weimar are a special treat to anyone who gets one and I can’t imagine not having my big beautiful blue boy. Gob and Kurt share a rare moment of snuggling together.